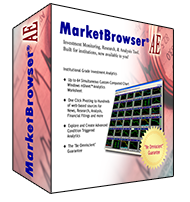 Institutional Investment Analysis Power - Only $60 more than MarketBrowser Pro! AE Technical Studies *160% MORE Studies! AE Analytics *700 Math & Program Functions! *Note: Advanced Analytics featured in MarketBrowser AE include: 160% more technical studies, "Build Your Own" custom analytics, 700 Math & Programming Functions, Conditional Analytics™ for easy back-testing of trade strategies, Correlation Matrix for evaluating diversification, & mSheet™ Investments Scorebox. 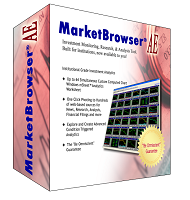 For more specific information about MarketBrowser AE features click here. Copyright © 2000-2019 Leading Market Technologies, Inc. All Rights Reserved.